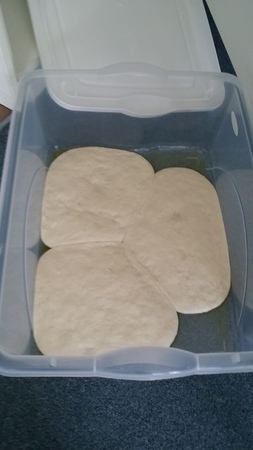 The Pizza Bible - Getting dough ball to retain some sort of shape ? I'm very new to this good pizza making stuff so have been following the many recipes and guides on the Internet / Youtube and not really having much luck coming out with anything that resembles what I'm supposed to be making. First is, once I shape the dough into balls (as per recommended methods) and put them into a container to "proof" they end up flattening out. Why is this ? Even right away you can see them not holding a shape very well but over night they have spread outwards many times their original width. Quite bubbly / airy and very tricky to remove make into a base (final product still rather tasty mind you). The longer I leave it, the worse (or flatter) it gets. Aiming for 24 hours. What could I be doing wrong ? Recipe / method at bottom. Second,- what would be the best way to prepare the proofing container so the dough balls don't stick ? Just flour on the bottom ? Or oil ? Thirdly; I don't have the luxury of a dough mixer or whatever so all my mixing / kneading is done by hand. When a recipe calls for X amount flour, what about the amount you use for kneading ? How much do you use extra,- say if you are kneading for 15 minutes ? Or do you not use extra flour and save some of the original required amount ? Water with dissolved yeast in first, mix in flour and salt. Rest for 20 minutes, portion make into balls, rest or "proof" in container at room temp 8 to 36 hours. I often only use half that recipe but it should all be the same. Photo attached is now after 12 hours. Was only half batch so 3x 235g balls. Much smaller than that. Please help what am I doing so wrong ? Wow, you have a lot of questions! There are so many things to respond to, and to do that properly, you need a book. Check out the Pizza Bible, you'll be really happy with all the information in it, and if you just read the master class chapter, you'll find just about everything you need there. Thanks Adam. As much as I look forward to receiving and reading the book (and of course having a good reference on hand for times like this), being on the other side of the world it will be a few weeks away and won't help me this weekend.